Bouquet Au Drape tapestry is a lovely verdure showing a red drape on a foliage scene. Verdure tapestries began to flourish in popularity in the 17th century and was a celebration of the beauty of nature and their use in art. This tapestry shows a red drape near a bouquet of flowers on an urn in the natural countryside. The detailing is evident throughout this tapestry from the leaves and foliage in the foreground to the floral arrangement to the intricate border that surrounds the entire piece. 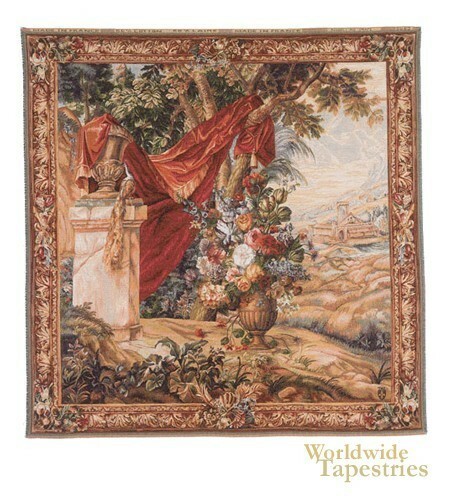 Verdure tapestries have been used to decorate the palaces of royalty including the palace of Versailles in France where an entire tapestry factory was created to produce works to decorate the royal palaces. This work is a gorgeous example of a verdure tapestry that celebrates nature and all the beauty it has to offer. This Bouquet Au Drape tapestry is backed with lining and tunnel for easy hanging. Note: Tapestry rod, tassels, and accessories, where pictured, are not included in the price. Dimensions: W 58" x H 58"